So after finally getting the Jeep back on all fours and the engine buttoned up the stupid thing refused to crank. So last night I started troubleshooting. 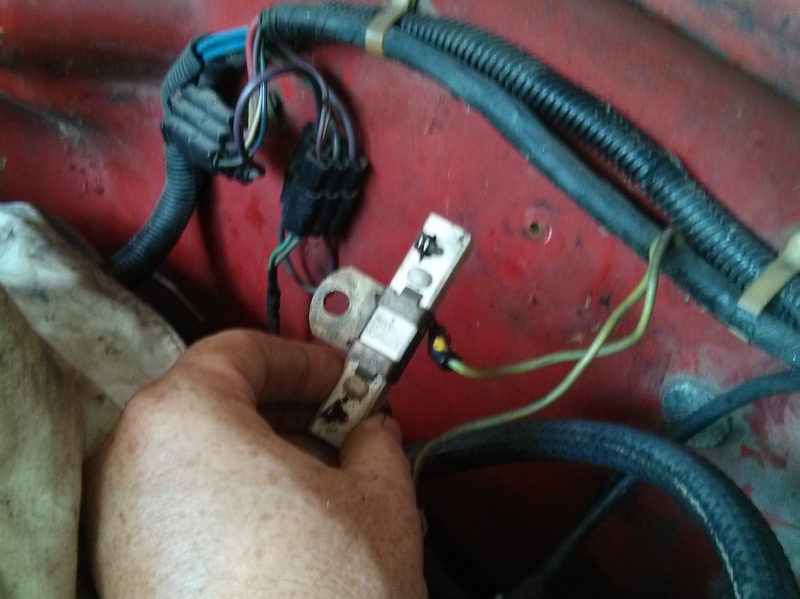 My general plan was to turn the ignition on and see if I had voltage at the coil. If not I would work back from there. I found no voltage at the coil and was just starting to work my way back when I saw smoke curling out of the ballast resistor. That was a big shortcut for my troubleshooting. 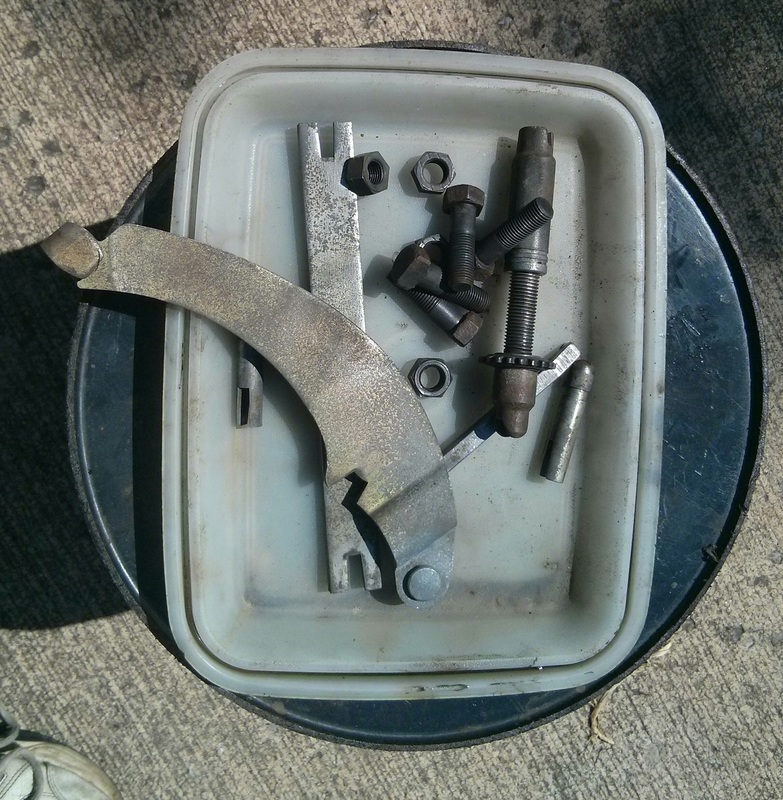 It took some careful work with Vice-Grips and a wrench to get the rusted terminal nuts off. I neglected to take pictures but here is me holding the resistor near where it mounts to the firewall. The green wires attach to the resistor. Yesterday was hot and miserable out but Rachael and I got a lot done on the Jeep. 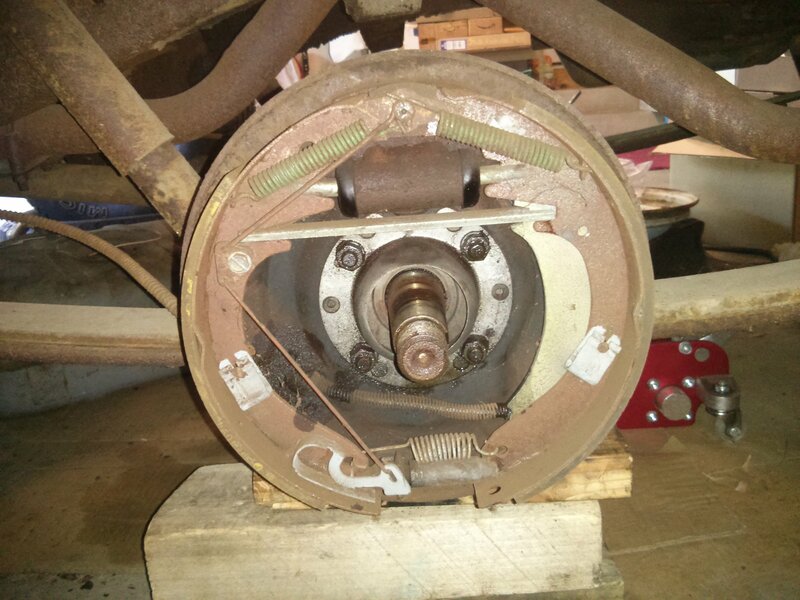 I was looking something up in the manual an realized I had put the brake shoes on backwards. On each brake there is a long shoe and a short shoe. I reflexively put the long shoe in front like on my Studebaker. But the Stude does not have self-adjusting brakes. On the Jeep (and most cars) the small shoe goes in front. The rotation of the wheel pushes on the brakes and forces the larger rear shoe against the drum harder. So here is the wrong way to do it. The rear of the car is to the left so the small shoe is in back. WRONG. 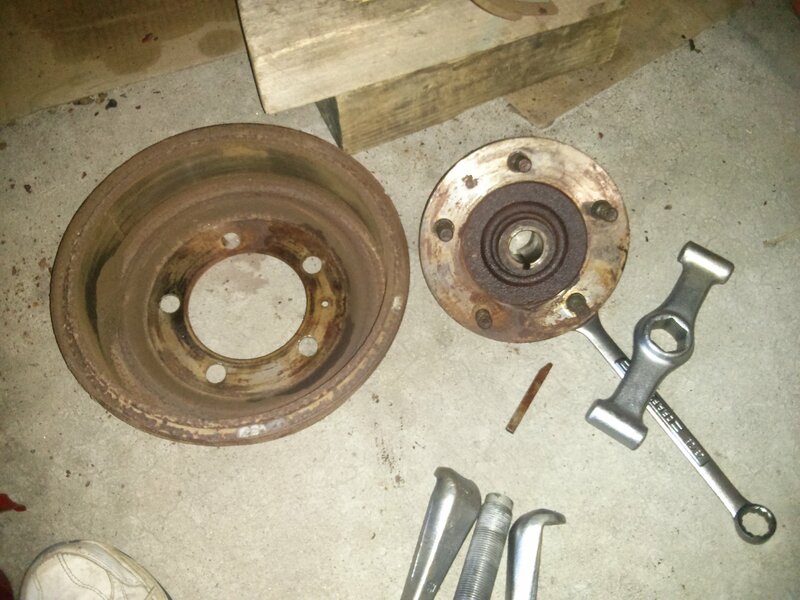 I took apart all four wheels and fixed it. What a pain. 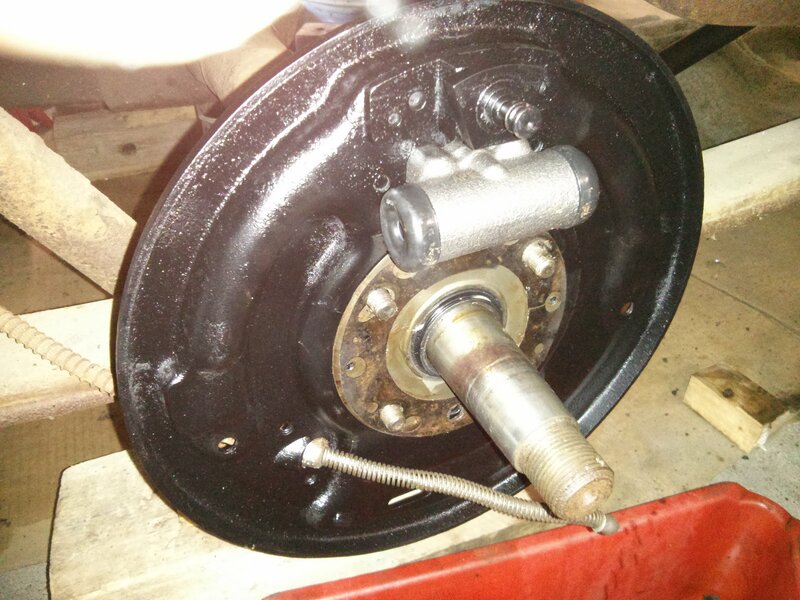 Tried to finish the brakes tonight but did not quite make it. I got this last brake line in and tightened up. 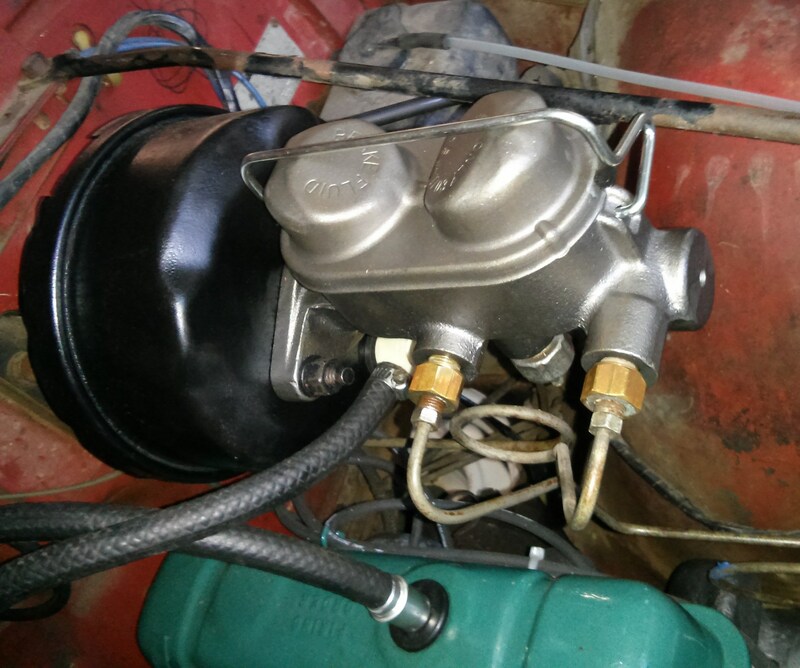 Attached the brake lines to the master cylinder. Hooked up the brake light switch. 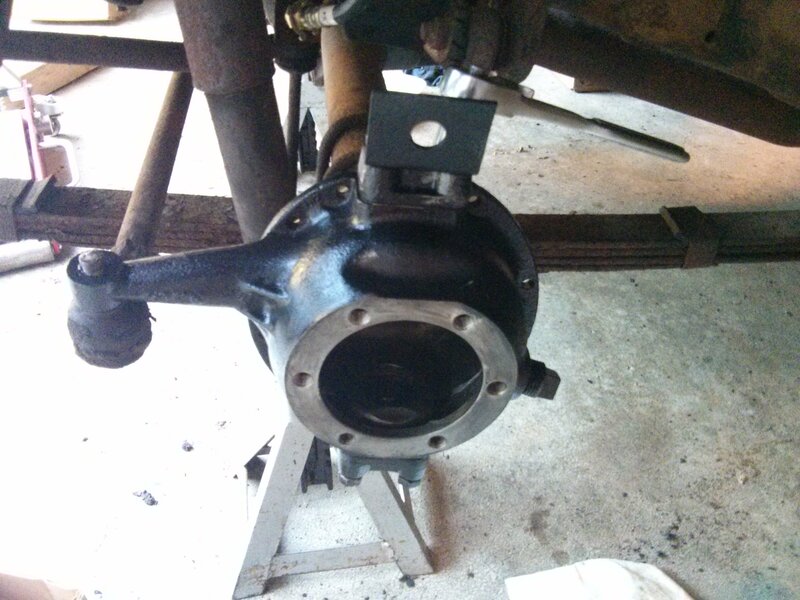 I also got the back brakes adjusted. Here is a picture of me rehearsing how to adjust the brakes. 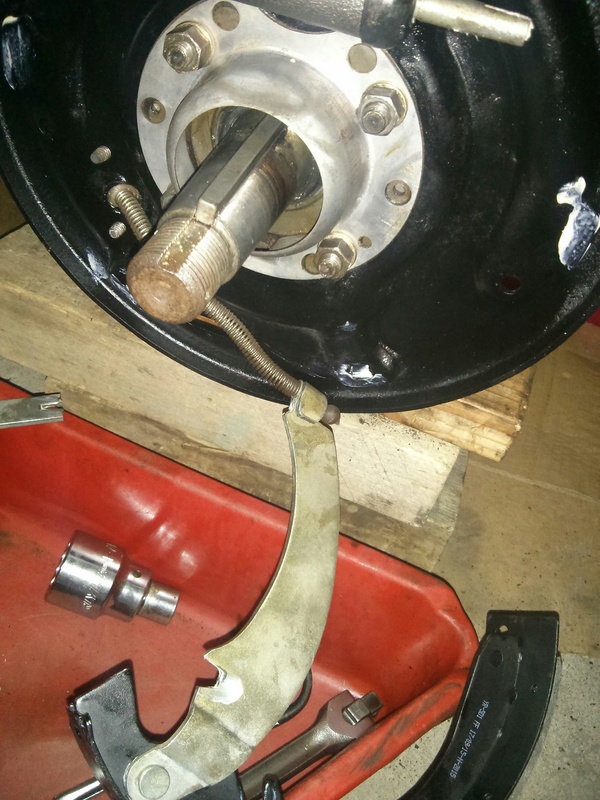 I am using the 1/4″ wrench to push the adjuster lever away from the star wheel then using a screwdriver to spin the wheel. 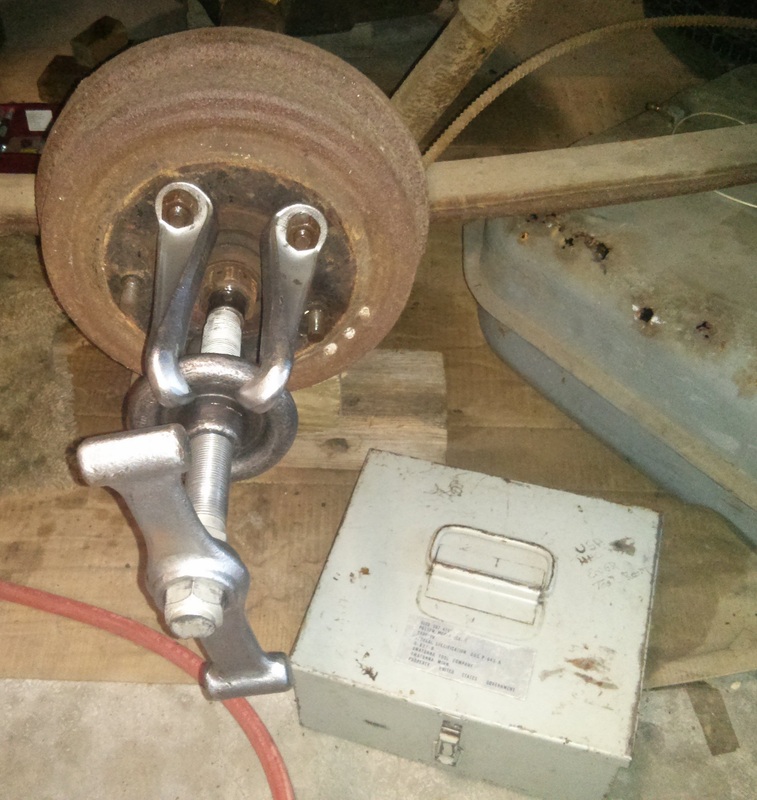 This worked pretty well but was a lot harder with the brake drum on so I could not see anything. Anyway I got both back brakes adjusted before I ran out of time. I will finish this next time then bleed the brakes. 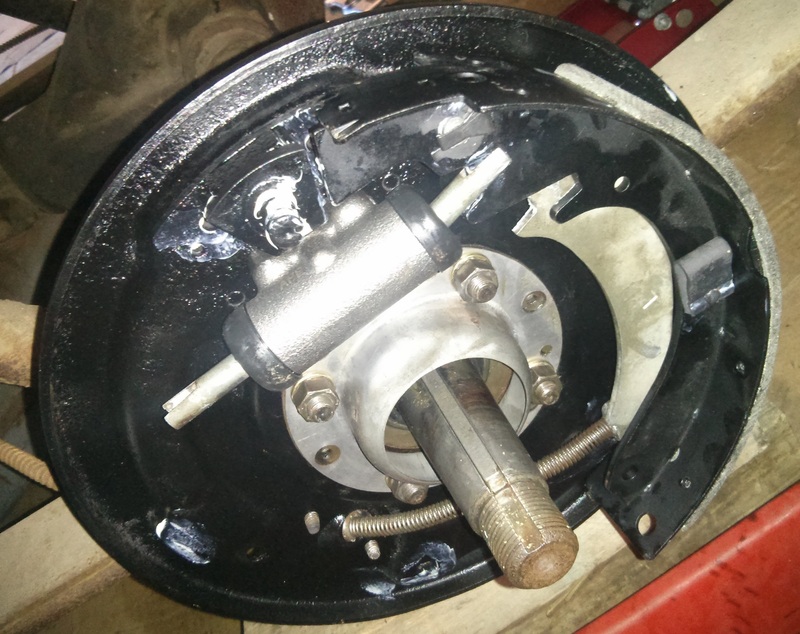 After a couple days off the project for flying, Father’s day, my wife’s birthday, and my youngest daughter’s college orientation I got back to work and put the passenger rear brake together. It is basically the same as the other side so I skipped taking pictures. 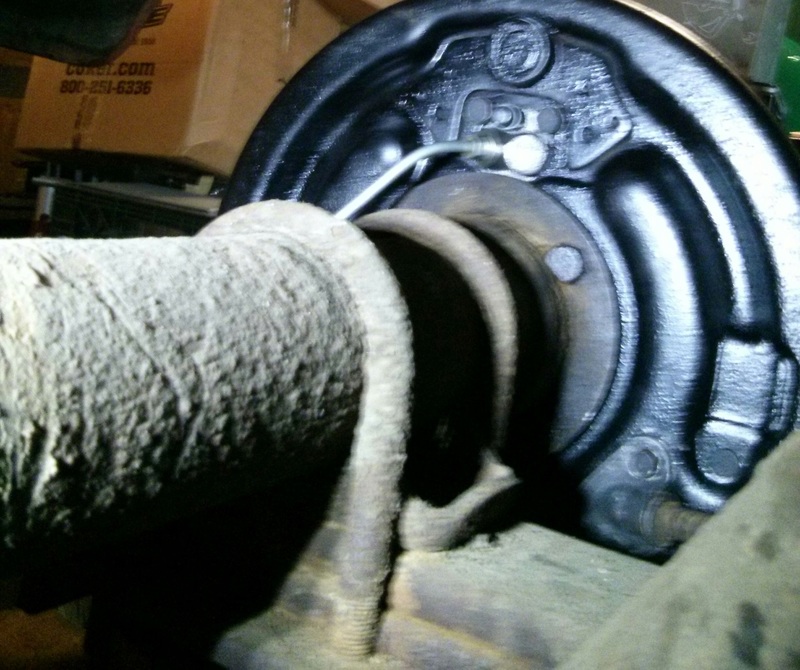 The car is missing a washer under the axle nut. I ordered a replacement but the wrong one came. But I can put that on later. 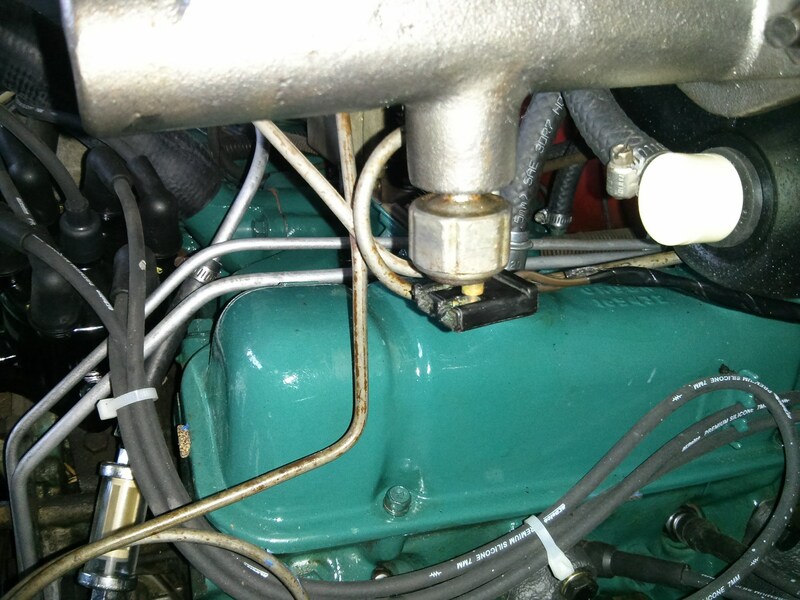 Everything went smoothly except I forgot the new gaskets on the grease seals and had to undo some steps to put them on. I was about to hook up the brake line when I got called away so that will have to wait until next time. 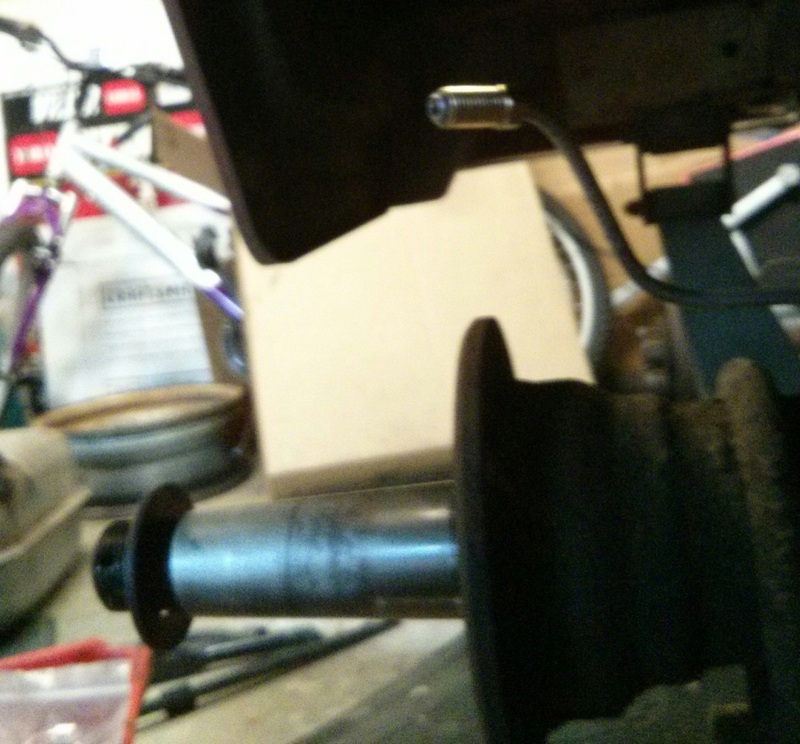 Once the brake line is hooked up I can adjust the brakes then bleed them. Then the car should be ready for rolling and stopping. 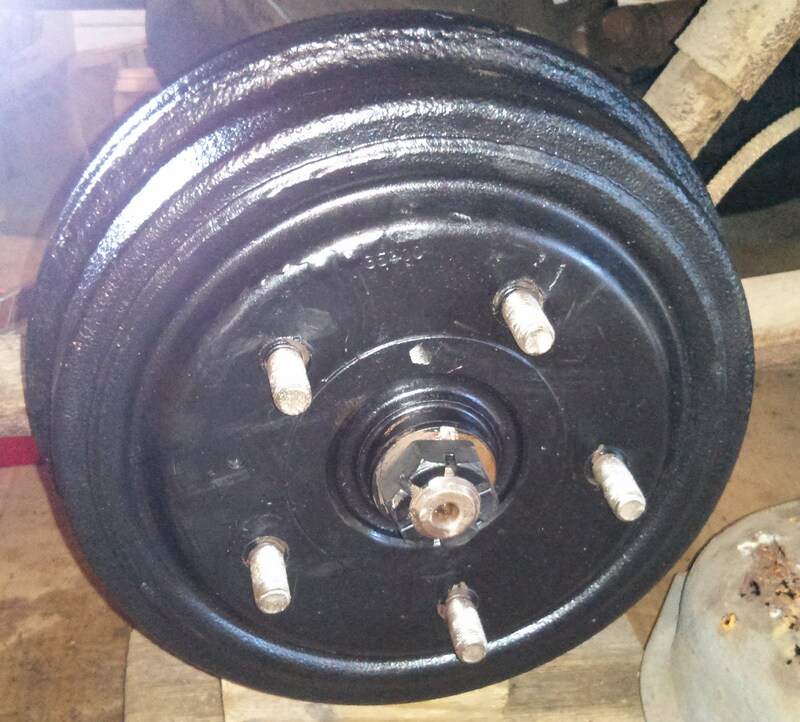 I cleaned and painted the parts for the last brake but that is boring and we have seen it before so I did not take any pictures. 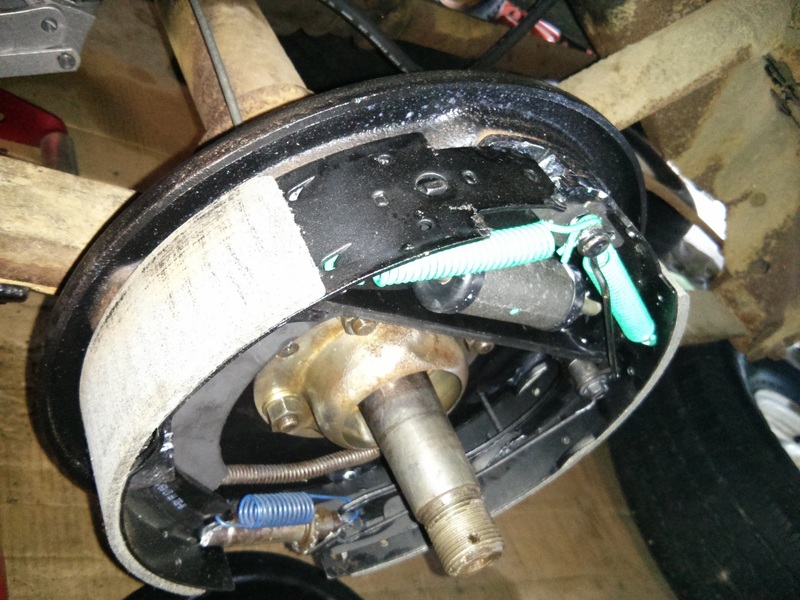 But I also finished running the brake lines. 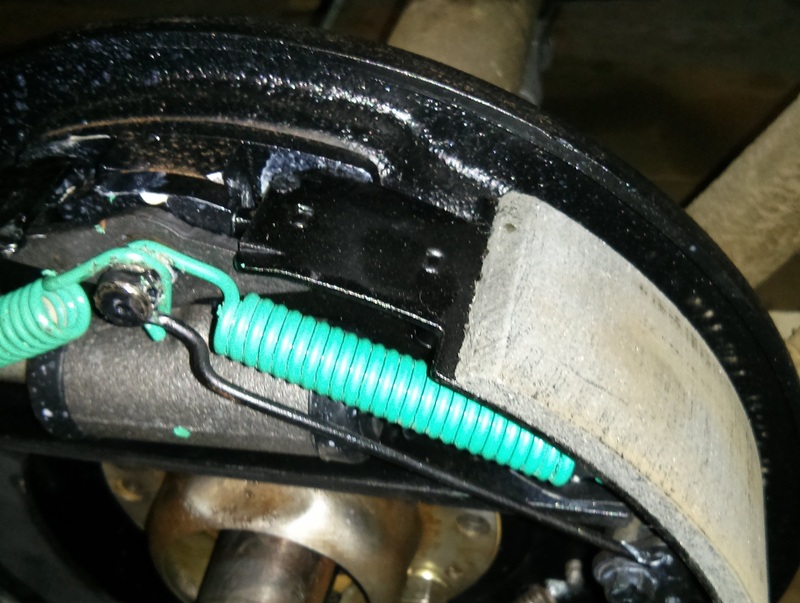 Here are the rear lines going into the T-fitting on the axle and the new hose snaking up to the line from the master cylinder. Lots of fuzzy pictures here since it was dark, under the car, and I was trying to get my phone all dirty. 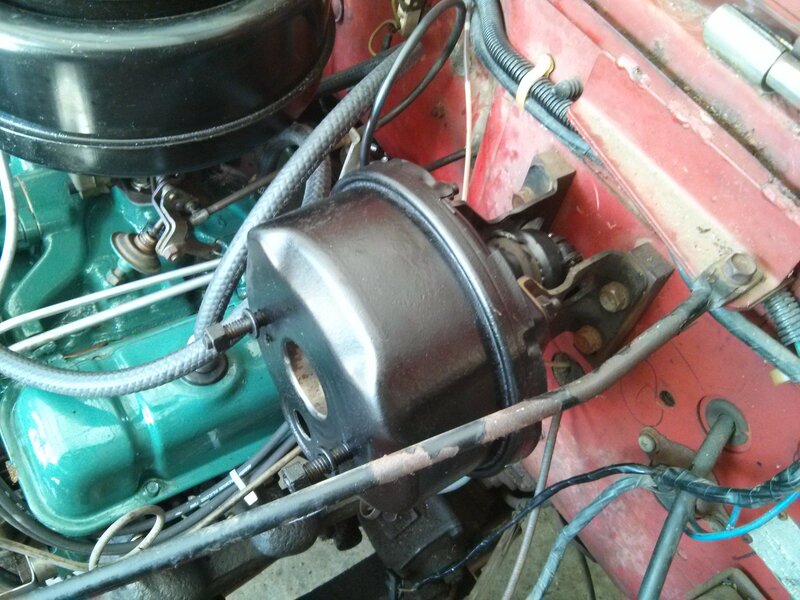 You can see here the line that goes over the differential all bolted up. 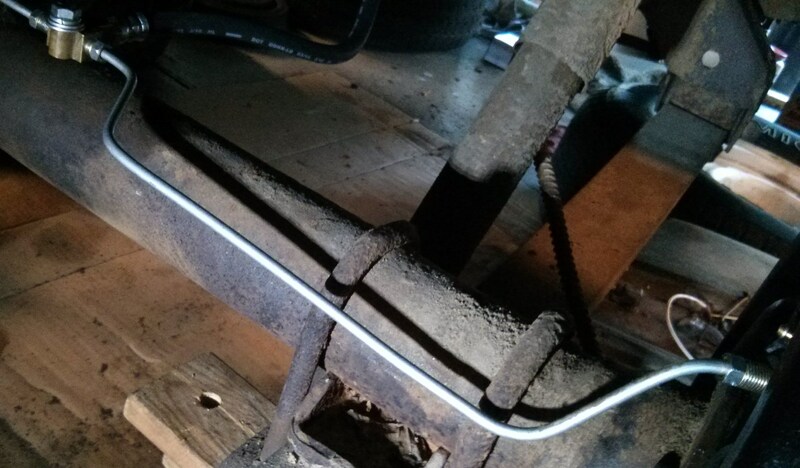 The paint is still drying on the backing plate so the other brake line is just hanging there. And the picture is fuzzy again. 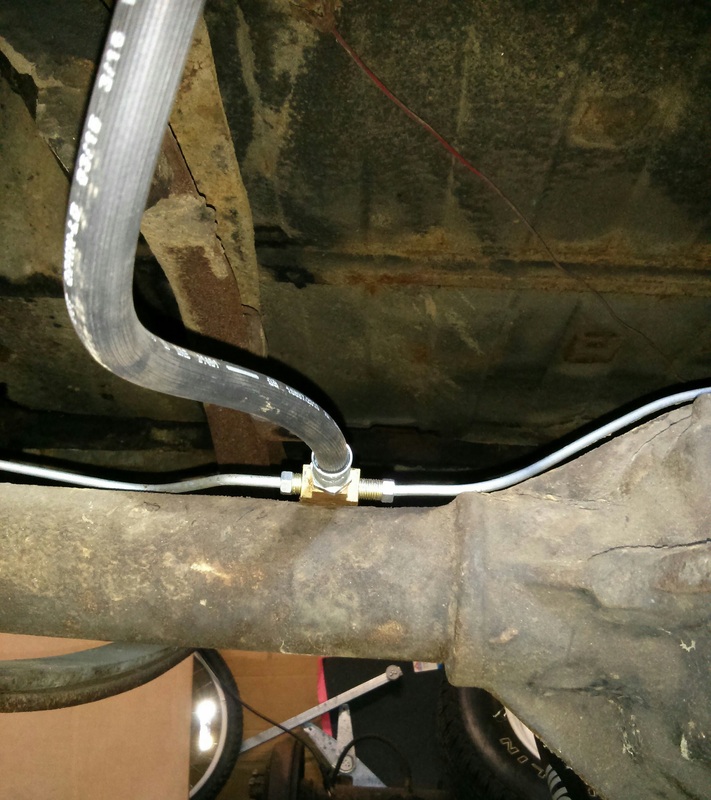 And finally the other end of the hose is connected to the brake line. Notice the red wire. I don’t know this is for but there are wires strung here there and everywhere on this car. This one goes into a dubious wad of electrical tape then ties to a couple of wire nuts (!!!). Other wires go from there to the taillights. 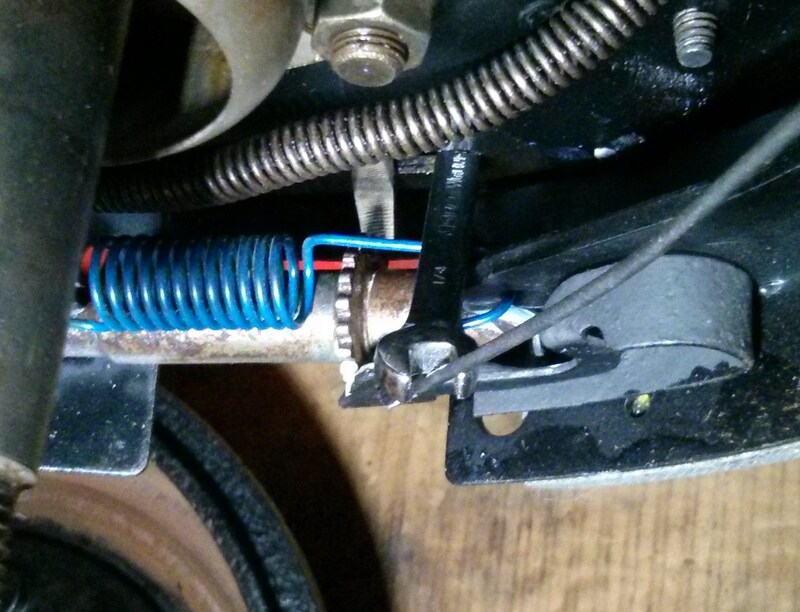 I think a wiring harness is going to be an early upgrade if this car is going to be a driver. 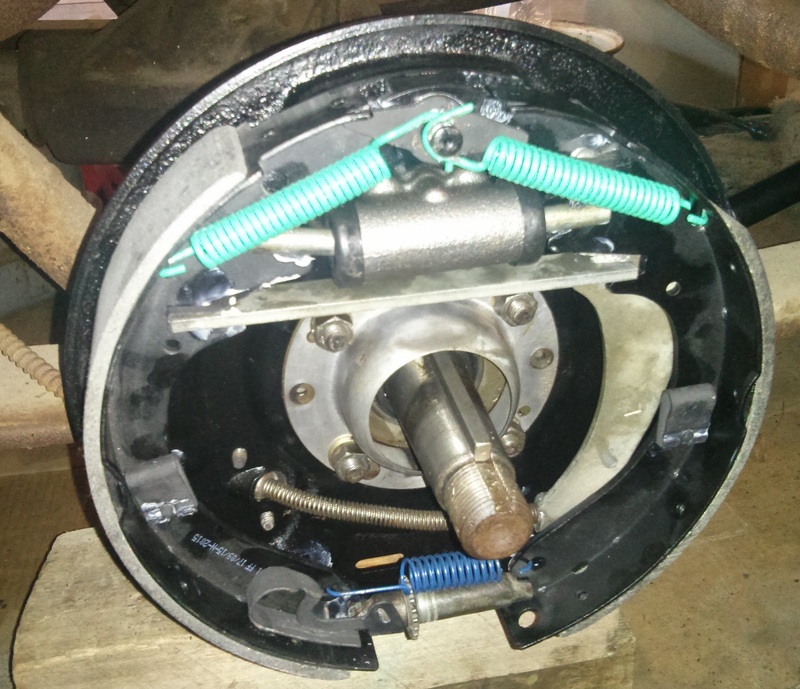 Ready to assemble the driver’s side rear brake. 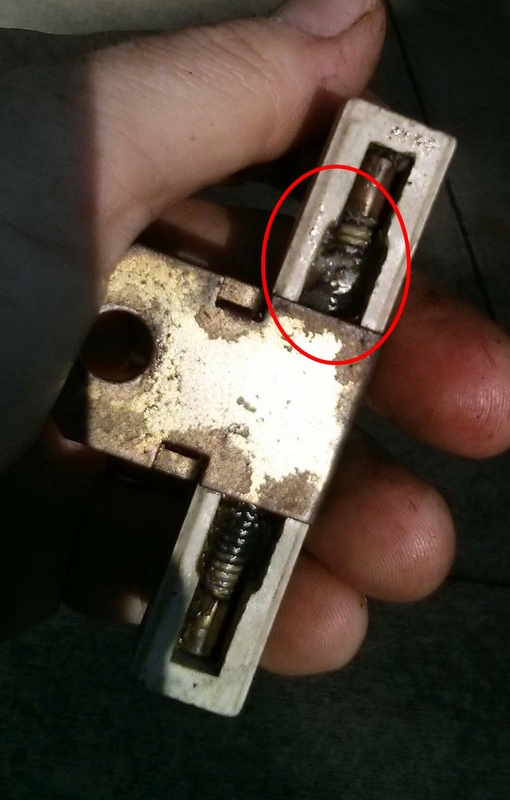 First the bolts go in from behind and the bearing retainer plate goes over them. 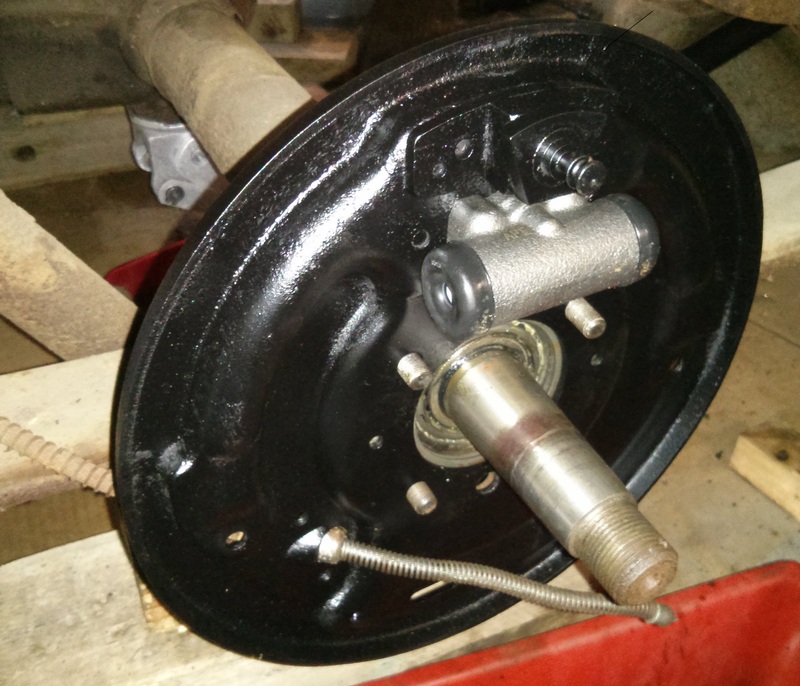 Then the new wheel cylinder goes on the backing plate. 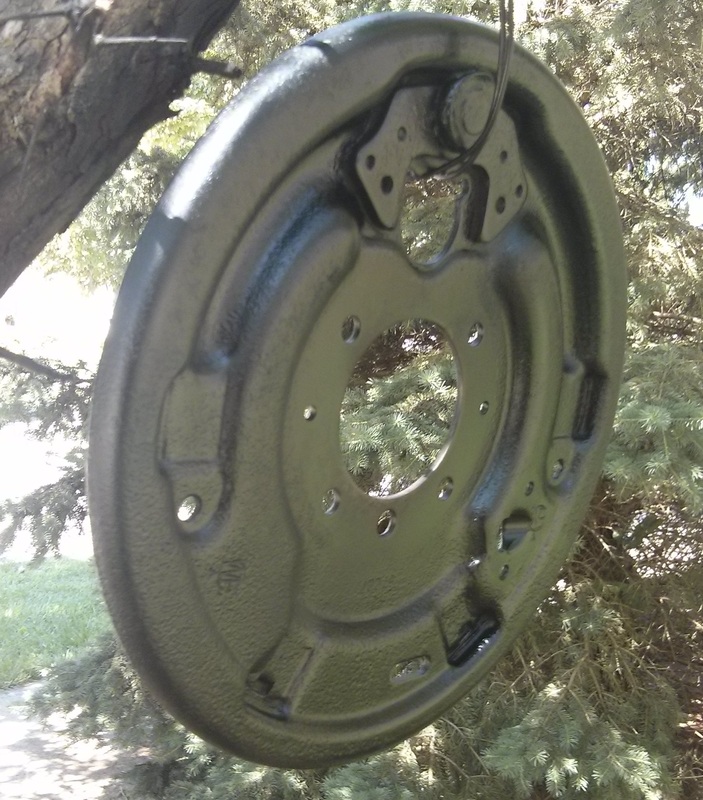 The parking brake cable goes though the plate and the plate goes over the bolts. The leak-catching grease cup thing is the last item in the stack. Now that backwards grease seal is out of sight. Meanwhile the plate and cap screws in my hand hold the parking brake cable to the back of the plate. 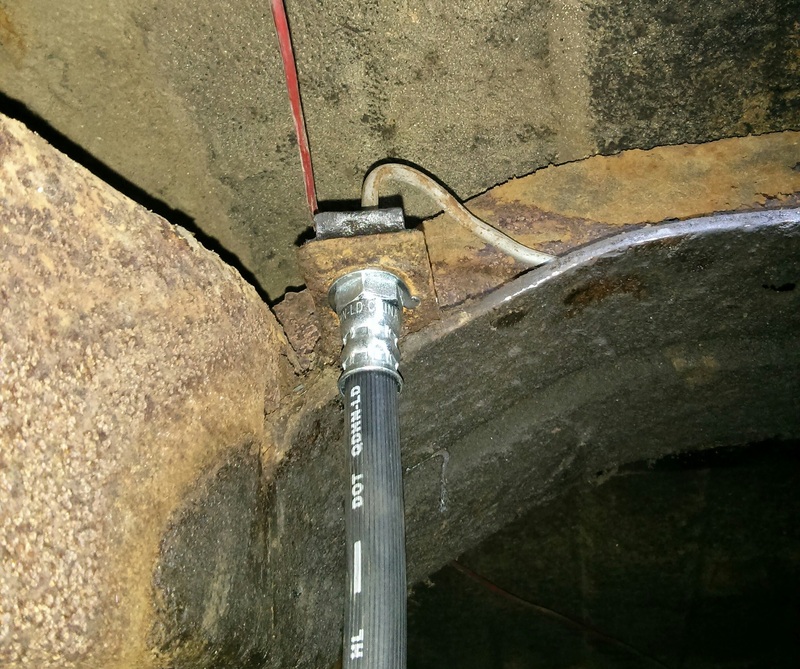 The parking brake lever is attached to the trailing shoe and the cable is attached to the lever. I had to file out the hole in the shoe a little to get the lever to fit. Everything else installed. Just to be sure I did it right I went back and looked at my pictures from the tear-down. That is when I realized that grease seal is backwards. Dammit. The trick here is to take apart as little as possible. That turned out to be the self-adjusting rods and upper springs. There. That is better. 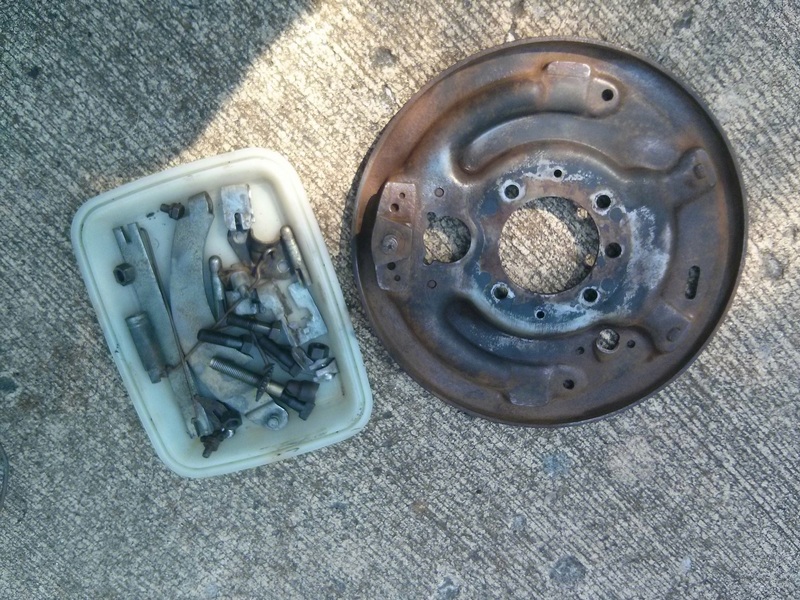 As you can see I reused the gaskets on the seal. They were not bad on this side but I ordered new ones for the other side. Hopefully I can put the other side together without as much drama. 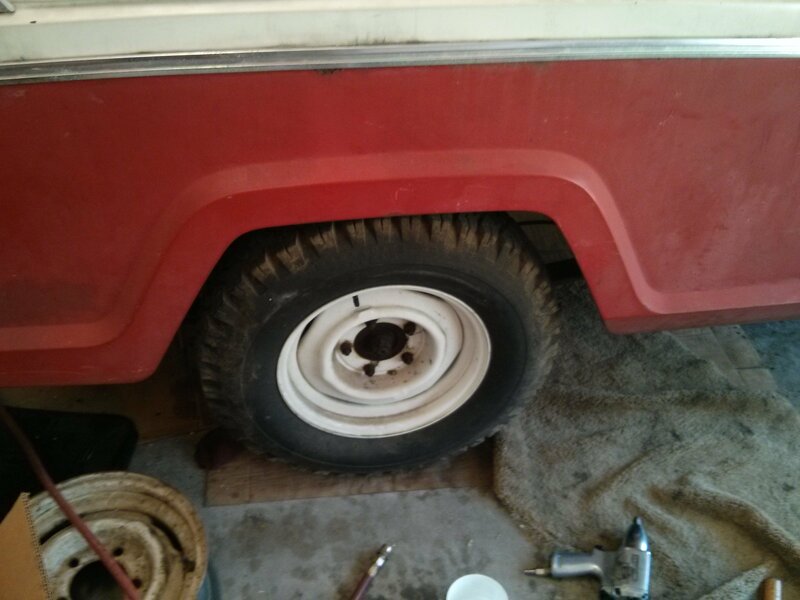 That is three wheels done! Time to go after the rear brakes. 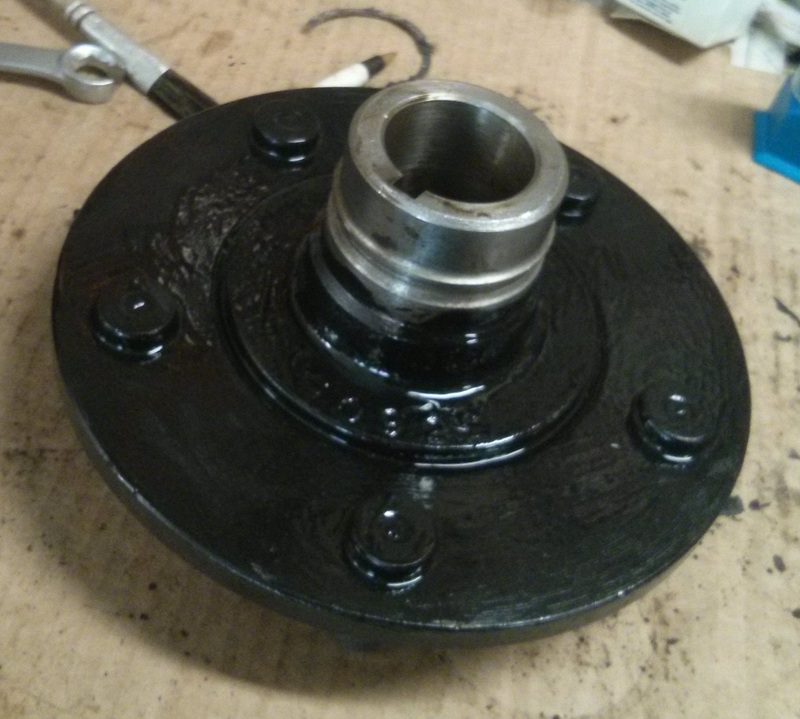 I had to buy a 1 7/16 socket to get the axle nuts off. 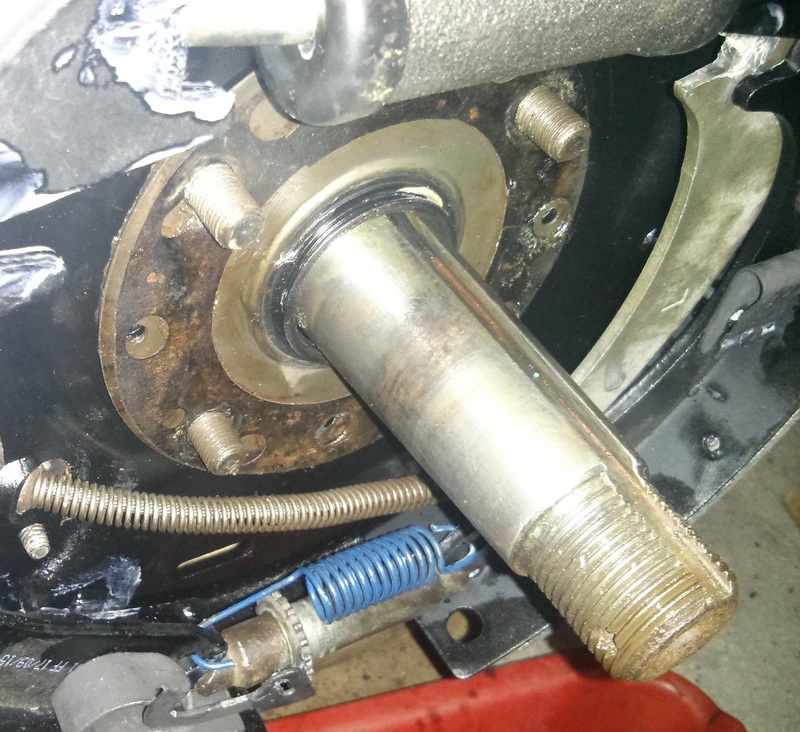 After removing the axle nuts and wheels it was time to pull the hubs. At least I have the right tool for this job. This puller is military surplus and was probably used to maintain jeeps back in the day. 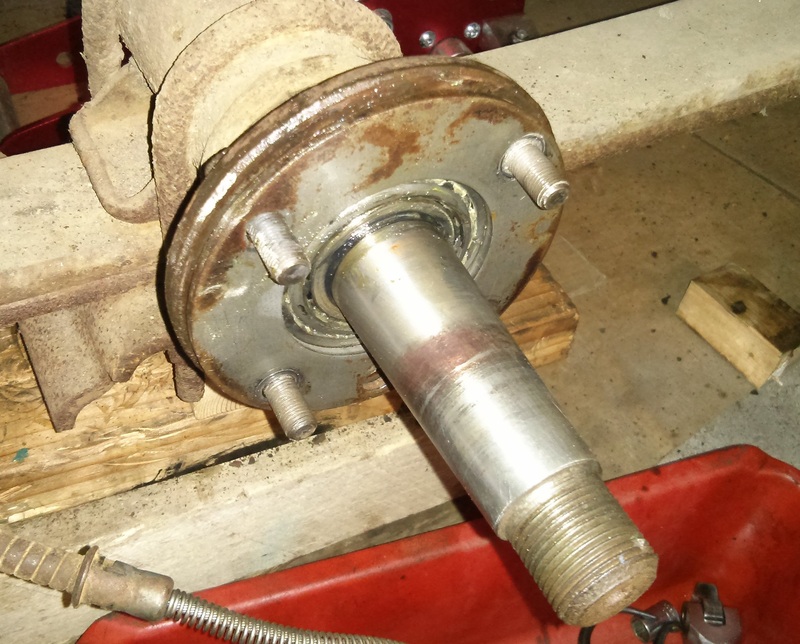 Notice how the axle nut is turned around on the end of the axle shaft. This both protects the shaft from mushrooming and keeps the hub from flying into my face when it pops. 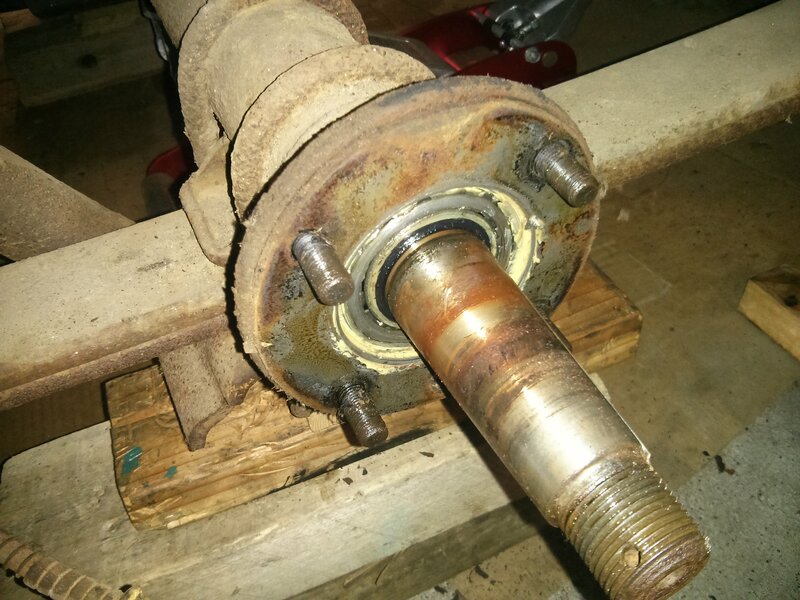 After some serious hammering with a sledge the axle popped off. Sounded like a rifle shot. 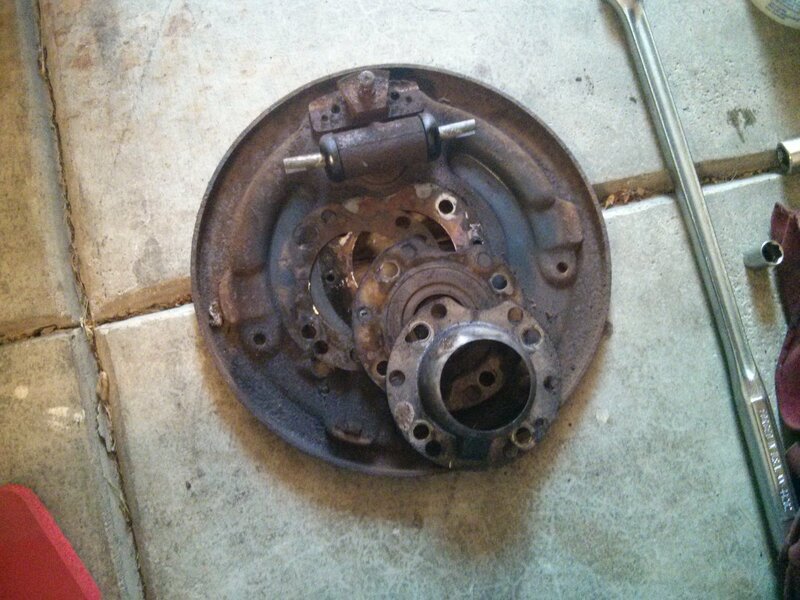 Once it came loose the hub came right off. 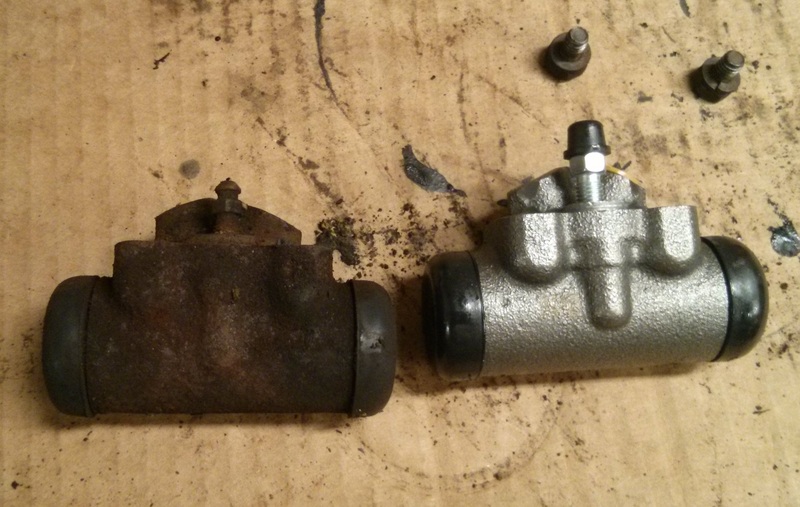 For whatever reason the rear brakes are a lot less rusty and cruddy than the fronts. This almost looks like it could work. But it is getting torn down anyway. 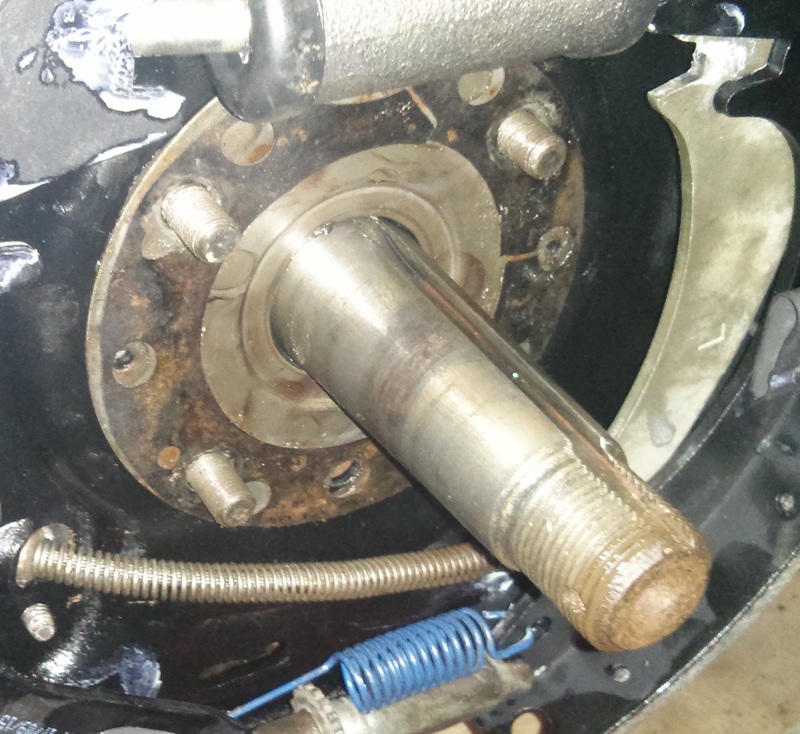 Backing plate and bearing retainer removed. 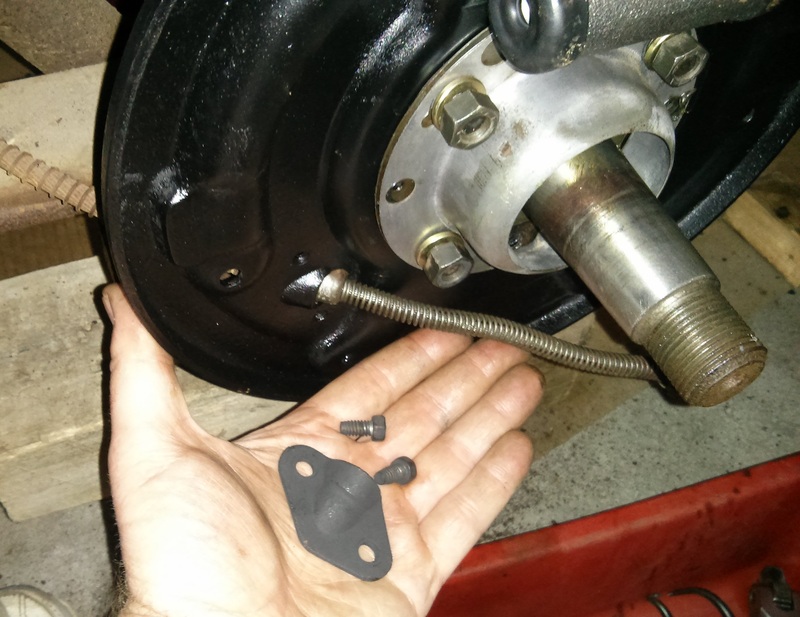 I bought new rear axle seals but they are the wrong ones. That is the bad news. The good news is the seals that are in there look just fine. 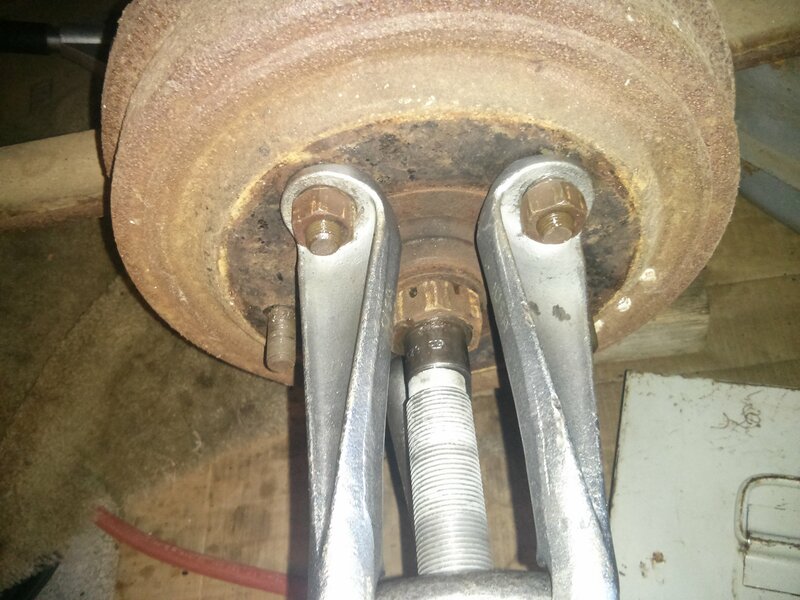 I cleaned up the axle taper to get that rust off. After a parts cleaning session things are looking decent. Parts that are not going to be painted. I brush painted the visible parts of the hub. 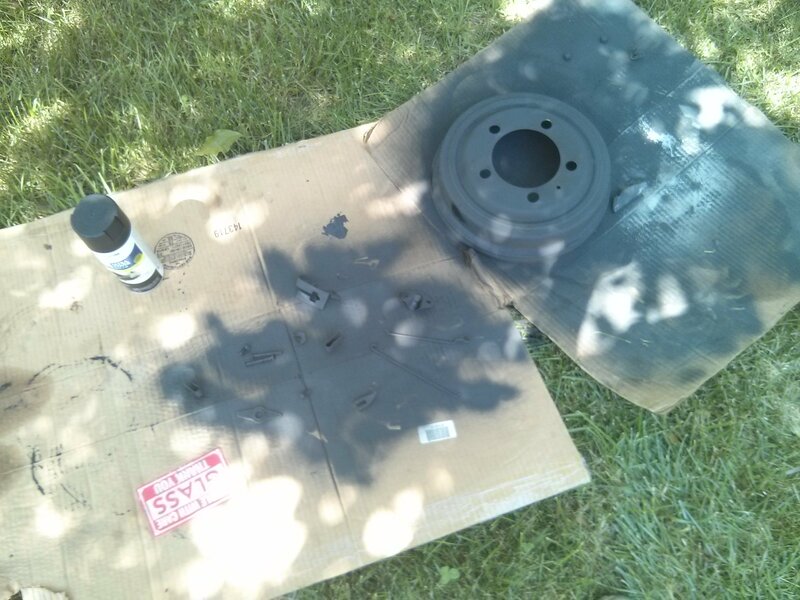 And sprayed the backing plate. Once all this dries it will be ready to put back together.